It is with sadness that we pay tribute to Edmund Capon. 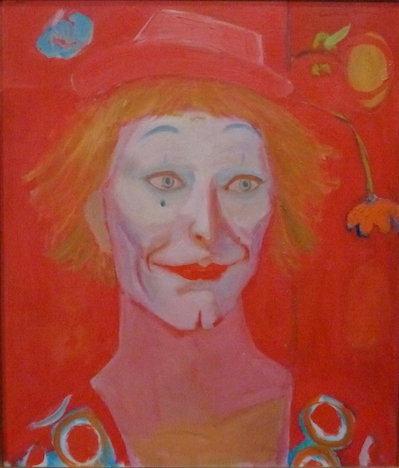 An individual as unique as his mismatched socks, his engaging personality brought much to the Australian art world and his enthusiasm and accessibility were but some of his special attributes. Our thoughts are with Edmund’s family and friends and all at the Art Gallery of New South Wales. Vale Edmund Capon AM OBE. To read the tribute from Wayne Tunnicliffe, Curator of Australian Art at the AGNSW please click here. Image copyright Sydney Morning Herald. On International Womens Day, we’re celebrating all women worldwide; and in particular one woman close to our hearts, Lauraine Diggins. The staff at Lauraine Diggins Fine Art are very proud that Lauraine has received a Medal of the Order of Australia at this year’s Australia Day Honours for services to the museums and galleries sector. Beyond her reputation in the commercial art world and relationship with numerous artists, Lauraine enriches the visual arts in this country through her support and philanthropic contribution to many public institutions. We particularly admire her ability and passion in placing artworks in public collections for all the nation to enjoy. Her promotion of indigenous art, from the expansive exhibition A Myriad of Dreaming: Twentieth Century Aboriginal Art in 1989; her success in negotiating Gloria Petyarr’s representation through the international fashion house Hermes; her ongoing involvement in the arts of Utopia and her keen sense of an educational focus through the Gallery’s website are worthy of recognition. Congratulations Lauraine, it is a well-deserved honour. It is with great sadness that we farewelled our Gallery dog Indi this month. She was a very dear companion to Lauraine and family and Gallery staff. Hopefully she has found her friend Matilda and they are chasing seagulls & balls on the beach. The Gallery won’t be the same without her. Millie and particularly Roxy are missing her. Following last week’s documentary on John Peter Russell (which you can now catch on iview), this Tuesday 6th November the ABC is screening a documentary on Sidney Nolan at 9.30pm. Nolan’s iconic imagery, especially his Kelly series, is ingrained in the Australian psyche. Everyone feels they know Nolan, but that is far from the truth. 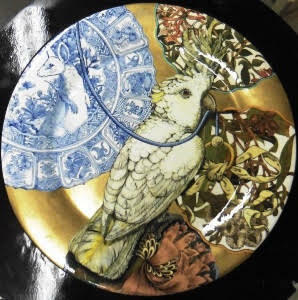 The outstanding works by ceramicist Stephen Bowers continue to gain the interest by international collections. Ming Meets Morris Meets Macropod is a recent acquisition by the Peabody Essex Museum, Massachusetts, USA. Ming Meets Morris Meets Macropod 2018 jigger jolley, white earthenware, underglaze color, clear glaze, on-glaze, ‘distressed’ burnished antique gold, 2.5 x 35.7 cm. Against a back ground of lobed reserves, a Sulphur-crested Cockatoo ( Cacatua galleria) perches, holding in its beak a length of blue twisted string from which the bird is dangling a decorative bow arrangement The cockatoo references classic natural history (bird) illustration, being derived from, and paying homage to, the work of W T Cooper . The decorative yellow bow is sourced from Meyer’s Hand book of Ornament. The reserve above the bird’s raised crest is filled with Honeysuckle, a wallpaper design first registered by William Morris in 1883. The bird perches on another reserve depicting a fragment of fabric design (also called Honeysuckle) by William Morris 1874 (sample in the Birmingham Museum). Behind the chest of the cockatoo is a reserve decorated with Eucalyptus corymbosa (Bloodwood) from botanical illustrations in A Research on The Eucalyptus and their Essential Oils by Richard T Baker and Henry G Smith, Technological Museum of New South Wales, Sydney 1920. Finally, the large lobed circular fragment to the left of the cockatoo comprises a blue and white paneled border with elements in a central circular in-fill. The border and foliage details are based closely on Ming kraakwares held in the collection of the PEM Salem, in particular a porcelain Charger, 1573 – 1619, 3.3 ins (8.4 cms) X 20.7 ins (52.6 cms) dia. Museum purchase 1994. E84059. The paneled sections of the outer border contain motifs typical of the period including auspicious Buddhist regalia and symbols. The central circular reserve incorporates a rendering of the 1773 George Stubb’s Kangaroo – the first clear depiction of this Australian marsupial macropod. For details about available works by Stephen Bowers, please view our stockroom or contact the Gallery.